Best Wifi Analyzers for Windows (Mobile Apps) & Enterprise Network in 2019! 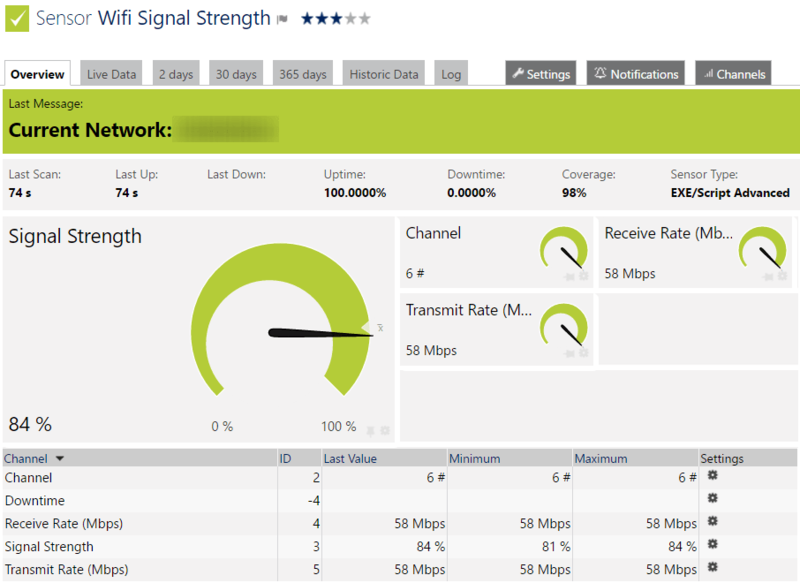 Best Wifi Analyzers for Windows (Mobile Apps) & Enterprise Network Environments! WiFi is an essential part of our lives, especially in 2019 – where everyone has a Smartphone or Tablet PC, our World has changed and is rapidly becoming more and more connected. Whether it is at home or at work, we need and depend WiFi to connect to the Internet, and the many apps that thrive on it. Unfortunately, the strength of WiFi signals can increase or decrease, depending on a host of factors such as interference and router’s performance. In such a case, how can you know which is a weak spot and which is the best place to fix your router? A WiFi Analyzer gives answers to these questions, as these apps detect all WiFi connections in your location and give a detailed information about each of them. You can see the strength of their signals, the networks on which they operate, heat maps based on the strength of these signals and more. With this information, you can decide where to install your router and even the places to avoid when you want to connect to the Internet! WiFi Analyzers give you comprehensive information about a WiFi network. If you have a Windows device, here are some WiFi analyzers that work great on Windows platform. Below you’ll find a quick summary of what each tool does, some screenshots, download & official website links to get your started on your journey! 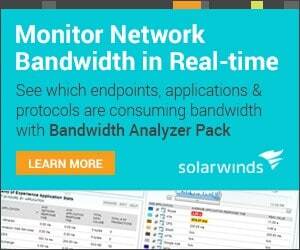 Solarwinds has Recently introduced their New WiFi Monitoring & Analyzer tool to the Market with a depth of metrics and information about your Network Access Points that you may not receive with other software programs we’ve mentioned below. 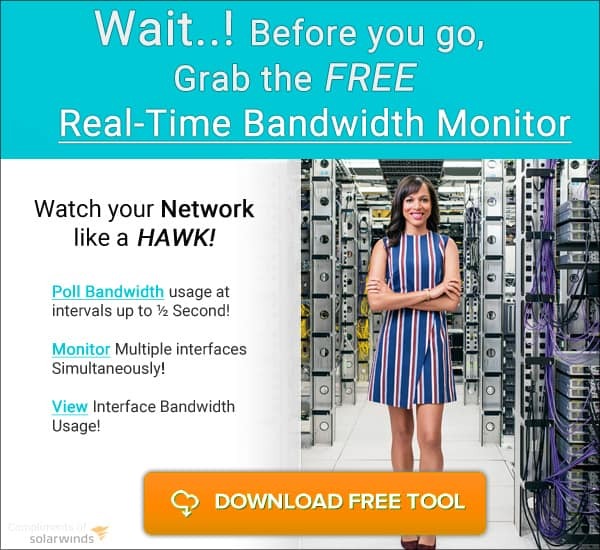 This is due to the Fact that SolarWinds is the Industry leader in Enterprise IT Management and Monitoring solutions and its in their Best interest to put out products that are above and beyond what you would get with a Desktop or Consumer Grade software (of which you will find further in this article). If you are a Power User, IT Admin, Network Engineer or are really in need of a Tool that will dissect your WiFi Network and Analyze it extremely well – then this is the tool for you. Lets jump right into some of the features that they offer with this tool. 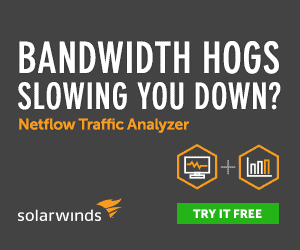 SolarWinds has really put out a great tool for those looking to get an In-Depth and deep look into their WiFi Networks and Analyze performance issues as well as monitor clients and their usage habits and statistics. PRTG by Paessler has another great offering similar to that of SolarWinds in that it brings a gamut of network monitoring capabilities into the Mix as an all-in-one solution. They have recently added a great WiFi Monitoring & Analyzing Sensor that allows you to check, scan and monitor Wireless Access points and their metrics. 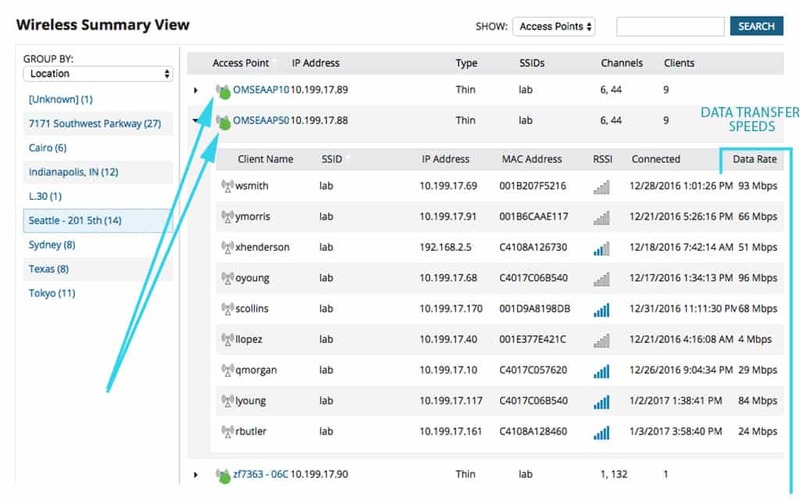 This Tool is a great all around tool for Understanding your Wireless Networks capabilities, troubleshooting dead spots and analyzing your WiFi Networks for Throughput and So much more! 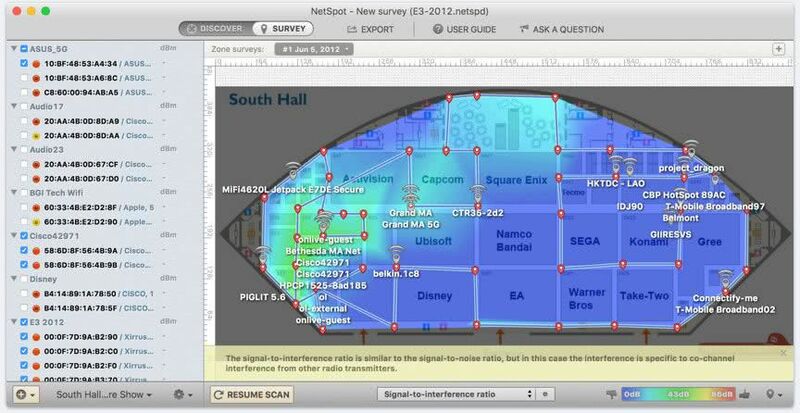 NetSpot gives all the details regarding your Wi-Fi, so you can plan its location and use. Collects live data from all the surrounding WiFi networks. Presents all the collected information in the form of an interactive table to help you understand the strength at different locations. Based on this information, you can troubleshoot your WiFi network, in case of any problems. Allows you to improve the coverage of your WiFi, capacity, performance, configuration and more. Customizable signal-level and noise-level charts show changes in WiFi strength in real-time. Comes with a discover mode that’s most useful to locate WiFi issues within a specific area. Identifies the busiest and the least used channels, so you can choose accordingly. Saves historical data and even exports them to a CSV file. 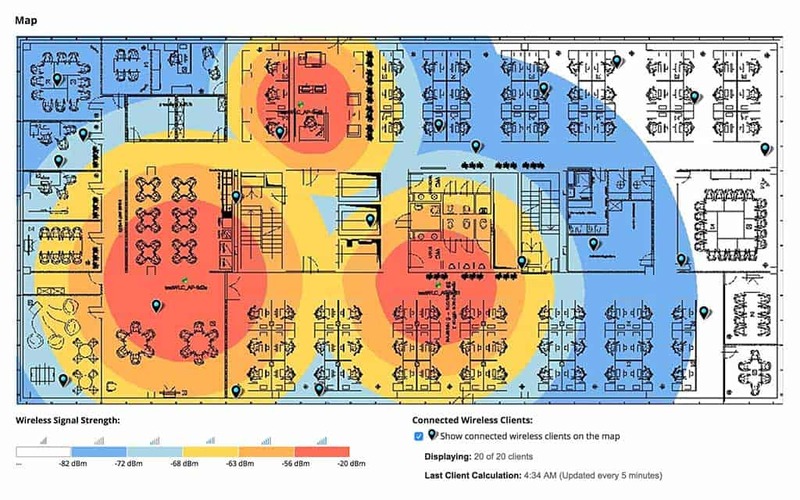 Displays color-coded heat maps that help to identify the strength and coverage of different WiFi networks. Offers professional reports in different formats. These formats can be customized to meet individual needs. Creates multiple zones within an area to represent different floors, areas and levels. These features are most useful when you want to set up a new wireless network. The best way to do that is to keep your hotspot in a specific location, take some samples and repeat the same process in other areas. There are three editions in NetSpot – Home, Pro and Enterprise. Allows up to 10 users per license. Besides these three editions, there is also a free edition that is ideal for network planning and troubleshooting for Mac OS and Windows environments. However, its features are highly limited when compared to the paid versions. The free edition can be downloaded at https://www.netspotapp.com/downloads.html. 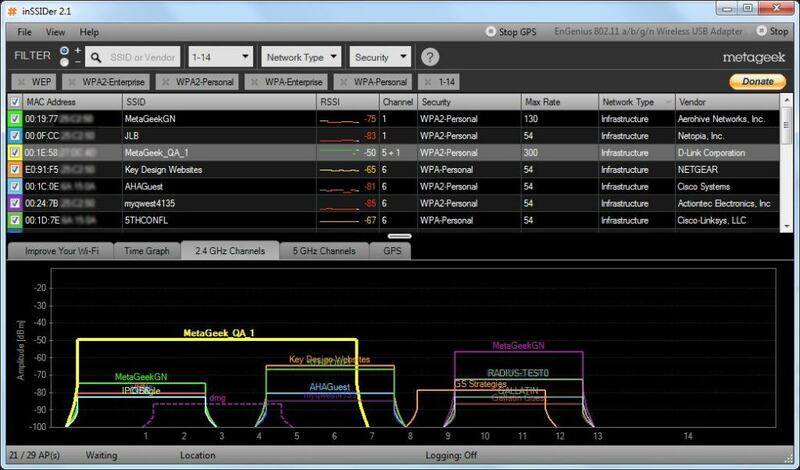 InSSIDer is a WiFi Analyzer from a company called Metageek, and is ideal for small networks. This tool gives insights into some of the most common WiFi problems to help maintain a reliable network. Scans the wireless environment and selects the best WiFi network for you. Performs a quick spot-check to ensure that the optimal channel is selected. Minimizes or eliminates interference from neighboring networks. Displays the network strength and signal over a period of time to help you identify the most reliable ones. Minimizes problems with dropped connections, especially while moving from one area to another. Recommends the ideal configuration settings based on real-time data, so you can get the most out of your router and connection speed. Identifies security issues to maximize the efficiency of any WiFi network. The most important feature of InSSIDer is its Wi-Spy spectrum analyzer that scans and identifies non-WiFi devices like wireless video cameras, cordless phones and Bluetooth speakers that could potential interfere with the working of WiFi connections. It also gives a complete picture of the Wi-Fi environment. There are two editions – inSSIDer office and inSSIDer essential. inSSIDer office is ideal for small networks, as it can view network interference, verify WiFi coverage and pick the best WiFi channel. inSSIDer essential includes Wi-Spy as well. In addition, this edition optimizes WiFi configuration and analyzes the 2.4 & 5 GHz spectrum. The cost of inSSIDer office is $149 and inSSIDer essential is $649. 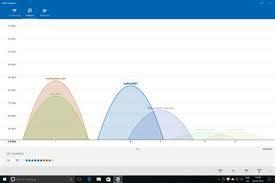 Wi-Fi Analyzer is a Windows app available on the Microsoft store. Developed by Matt Hafner, the basic version of this app is free. Finds the best channel as well as the best location for your router. Identifies problems with WiFi and gives appropriate recommendations to resolve them. Comes with a beeper to notify signal strength. Uses custom filters to select a preferred network. Works well on HoloLens, PCs and mobile devices that run on Windows 10 operating system. Gives detailed information about a router or an access point. Has an intuitive dashboard that displays relevant information such as your Wi-Fi’s link speed and health. Supports dark and light themes and access colors. The basic version of this app is free. But there are some features that come with only a pro version and this costs $1.99. 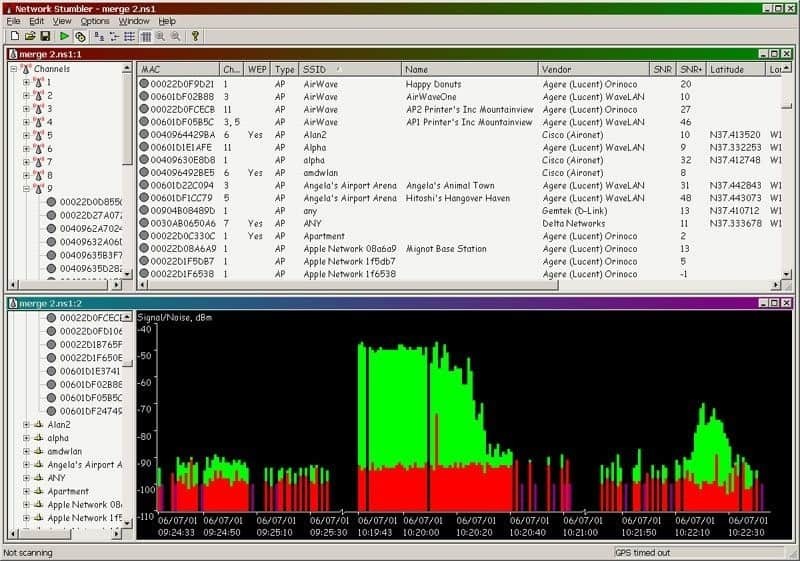 Vistumbler is an open-source Wi-Fi analyzer that works best on Windows operating system. Though the current version was designed specifically for Windows 10, it also works on Windows 8, 7 and vista. However .Net framework v4 is required for this app to work. Uses the Windows Native WiFi API or netsh to identify access points. Displays information about wireless networks such as the manufacturer, warranty and more. Supports GPS and COM-based NMEA receivers. Comes with live Google Earth tracking. Auto KML automatically shows access points on Google Earth. Gives audio output using sound files, MIDI and Windows sound API. It is open-source and is written in AutoIt scripting language. Scans different wireless networks within WiFi antenna and tracks signal strength. NetStumbler is a free Windows tool that detects Wireless networks and identifies problems. A trimmed down version MiniStumbler is available for Windows CE operating system. Though this product does not have any support, it continues to be popular among users because of its performance and simple interface. Detects all wireless LANs that use 802.11b, 802.11a and 802.11g WLAN standards. Detects unauthorized or rogue access points. Creates a GPL WiFi map to locate the hotspots. To conclude, WiFi Analyzers and Monitoring Tools (either for Enterprise or Consumer/Home Environment) are important tools to Use in order to reduce WiFi Problems and increase the strength of Wi-Fi Networks within your Environment. We’re brought to you a solid of tools and software that you can use to Monitor and Analyze your WiFi Networks, Access Points, Infrastructure and Environment to ensure Speeds stay High and Dead Spots are no More! 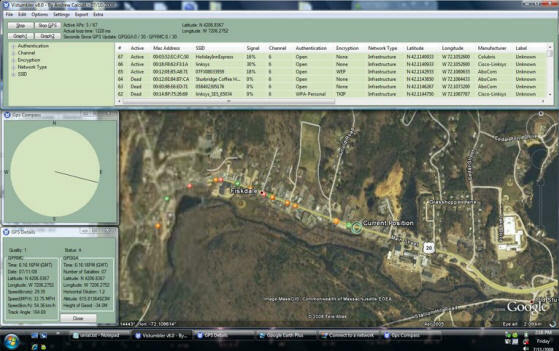 Grab a Download from above and Get Monitoring Today !